Like a host of other ‘historical’ films detailing periods of injustice (Selma, 12 Years a Slave, etc.) Suffragette hits the mark when it comes to pricking one’s consciousness and making one think twice about what it must have been like to live at a certain point in history. But is that really enough – what happens after the film finishes? Do we talk about the issues for a bit before moving on? Just how effective are big movie productions at stirring the public to action – or is it all just about how great Mulligan/Streep/Bonham-Carter/Duff’s performances are (and they’re all pretty good)? The reason for such questions stems from the whole experience of being at the cinema, waiting for the film to start, watching the adverts/trailers that precede the film. Never one to turn up dead on time because of the tardiness of film showings, the screen is in darkness with an advert running that speaks of strangers coming up to you, stroking you (uninvited) and stuff, and then the hashtag #gropefreenights appears. Then an advert about broadband speed and inspirational women, with an Alicia Keys song (an inspirational one) playing in the background. Then, a trailer for a Tom Hanks film. Then, a trailer for a Maggie Smith film. Then, the trailer for He Named Me Malala (#henamedmemalala). Then, an advert with Jack Whitehall struggling to come to terms with tackling a ‘lady’ rugby player – both humorous and subversive, potentially. 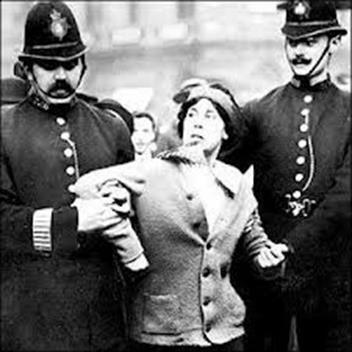 So, in an age where it seems men have to be actively persuaded to stop groping women whilst drunk (the men being drunk), and where we have a case in the not too distant past of a young girl being shot in the head in order to make the point that girls should not receive an education, will Suffragette prick the consciousness of those whose consciousness needs pricking, or do we find ourselves in a hundred years’ time looking back at Malala’s story, ooh-ing and aah-ing, whilst ignoring real and present concerns – whatever they may be in a century’s time? Perhaps it is not the place of big movie productions to stir such emotion, but if that were the case you’d have to ask yourself if there is indeed any point making such a film in the first instance. The time is now – but when is that? This entry was posted on Thursday, October 15th, 2015 at 7:21 pm	and tagged with Film, politics, Suffragette and posted in Culture, Film, Politics, Pondering. You can follow any responses to this entry through the RSS 2.0 feed.